There are many briefcase record players on the market, the Crosley Cruiser is not the only option, but it’s certainly one of the most popular suitcase style record players. I decided to give my readers an alternative. I’ve chosen to review the Electrohome Archer EANOS300 with built-in speakers because it has better ratings. What caught my attention about this one is that it’s large enough to hold a 33&frac13; rpm record inside. This allows you to close the lid during playback. 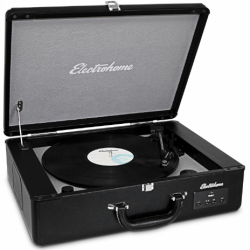 The Electrohome Archer is also one of the few portable record players that has an automatic arm return. There are, however, some downsides to consider, like the fact that there is no way to connect external speakers, so you are stuck with the sound produced by their small built-in speakers. If you are looking for an affordable record player, easy to use, easy to transport and easy to store, this player may be right for you. This is a good option for somebody who, from time to time, wants to play those old records sitting around and revive old memories. But young people can enjoy vinyl records too! Many young adults buy this player because is perfect for a small room or dorm, good option for college students. Nice piece of decoration for those who like vintage looking stuff. However, I don’t recommend this player if you are a serious about collecting vinyl or if you are looking for a high-fidelity sound. If you plan to play your vinyl records very often, then go for a better and more durable product. As many portable, inexpensive turntables, this one doesn’t have adjustment features and it’s prone to skipping, specially with newly pressed albums, so expect to use the old trick of taping a coin on top of the needle at some point (which may cause damage to your records). If you don’t care about portability, and you already own some speakers, you should consider buying a better turntable. For the same price you can get the fully automatic Audio Technica LP60. I’m serious!, for the same price you’ll get a far superior player, sound quality and durability. If after reading this introduction, you feel this turntable is right for you, keep reading this review. You’ll find great information that will help you make a good purchase decision. Other wise you can check my other reviews. The Archer turntable comes with a ceramic cartridge fixed to the tonearm. This type of cartridge is commonly found on low priced turntables. Ceramic cartridges produce an electrical signal in response to the bending of the ceramic material. This electric signal is high enough that there is no need for a pre-amplifier. This means savings for the manufacturer and a better price for you. Ceramic cartridges are cheaper and are less sensitive to external noises entering the system through the stylus. The disadvantage is that they don’t respond well to high frequencies and are more prone to skipping with high bass and drum like music. Ceramic cartridges have a bad reputation among vinyl collectors and audiophiles. Although, there are good quality ceramic cartridges, they are certainly not the ones included on low end turntables. The general concern is that, to avoid skipping, turntables with ceramic cartridges tend to have a heavy tracking force. This may damage or wear out your records and the stylus faster. What this means to you, the consumer, is that you should be aware that using this turntable may wear your records faster. Some users don’t care much about this. It really depends on how often you are planning on playing your records and how valuable they are. If your records are old and not in mint condition, then, this record player would be fine. However, if you own some rare or expensive albums that you cannot easily replace, then I would consider buying a better turntable that will keep your records in good condition. This unit comes with a diamond tipped stylus. The model number is EANOSBCC in case you need a replacement. The stylus will last approximately 300 hours of playback time. According to the manufacturer, the stylus can be used to play 33&frac13;, 45 and 78 rpm records. Sorry, but I don’t agree with the manufacturer, I think it’s just a marketing strategy. It is true that you’ll be able to play your 78 rpm records with the included stylus. So could you use a sewing needle attached to a paper cone! (See the video below). The fact that it makes a sound, does not mean that it’s the most appropriate needle. Long Play and 45 rpm records have microgrooves that are about 0.7 Mil (0.007 inch) wide, whereas 78 rpm records have wider grooves that are about 3 Mil (0.03 inch) . What this means is that you need a stylus with a wider tip for playing 78 rpm for better tracking which translates in better sound and less wear to the record and the needle. If you play a 78 rpm with a 0.7 Mil stylus you’ll notice that the sound produced has more background noise. The thing is that old 78 rpm records have some noticeable background noise anyway, so one may think this is normal, but you would be amazed at how the sound improves with the appropriate stylus. My personal advice, if you’ll be using this turntable to play 78 rpm records, is to get a special needle. You can find a special 3 Mil stylus at LP Gear. You can also search for 793-D3 stylus on eBay. The Electrohome EANOS300, is one of the few inexpensive portable turntables that has an automatic tonearm return. It is advertised as Fully Automatic, but it really isn’t because it doesn’t have a start-stop button. Therefore, you’ll have to manually place the needle at the beginning of the record. The good thing is that if you fall asleep, the arm will automatically return to its rest when it gets to the end of the record. The arm lifter or cueing lever is very convenient, it lets you position the needle slowly and smoothly. The arm has a lock lever for securing the tonearm. The tonearm returns automatically to its rest and the platter stops spinning when the needle gets to the end of the record. The player doesn’t have a start-stop button, so you have to manually position the needle at the beginning of the record. The automatic arm may not work properly depending on the location of the locked groove at the end of the vinyl record. If the locked groove is before the trigger point of the record player the player may never stop playing. On the other hand, if the there are music groves present after the trigger point, the arm return will be activated before the music ends. This is not a problem for most standard records. No advanced adjustments are present in this turntable, like counterweight, anti-skate or pitch control. So the operation is very basic, which may be good if you are looking for something easy to operate. This record player operates on normal 120V 60Hz AC only. If you live in a country where 220-240 V is the norm, you’ll need to get a power converter. The platter is made of hard plastic. This player supports all three rotational speeds 33&frac13; , 45 and 78 rpm. As it is the case with other cheap record players, the speed on this turntable is not very accurate. However, you may not notice it unless you play along with the music or if you compare it with a better record player. The pitch or speed cannot be fine adjusted. To avoid damage during transportation, the unit has transit screw on the turntable platform. This screw needs to be untighten before playback to allow the turntable to turn freely. You need to tighten the screw again when transporting your player. 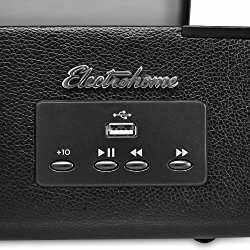 The Electrohome Archer has two stereo built-in speakers on the sides. They are loud enough for a small room. The sound is not bad considering the small size of the speakers. It has a 3.5 mm auxiliary input jack for connecting other audio devices in order to play them through the built-in speakers. You can also connect USB storage devices to play audio files stored in them. Note that the USB port cannot be connected to your computer, this port is not meant for audio streaming or recording. There are no outputs other than the built in speakers on this record player, not even a headphone jack. So your only choice is to use the built-in speakers. Unfortunately there is no tone control. So if your music lacks bass, you are just going to have to live with it. To me, not having output ports is a big disadvantage of this product. The sound quality is decent considering the size of the speakers and the price of the unit. The sound can fill up a small room without problems. Because of the ceramic cartridge, the sound tends to lack bass. So it has more of a high pitch sound. It would be nice if it had a tone control to adjust the equalization some how. The following video can give you an idea of the sound of this player. Obviously the sound is recorded through the video camera, so take it with a grain of salt. The EANOS300 has a vintage look inspired by suitcase portable record players of the 60s. 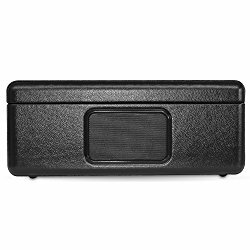 The briefcase box is made of MDF fiberboard wrapped with a black textured polyvinyl finish. It looks very nice and sturdy. However, some consumers have reported that the interior peels of after few months of use. What I like most about this portable turntable is that it can be closed during playback because it’s large enough to hold a 33&frac13; record. The top has a support bracket at 45 degrees angle that holds the lid open. This way you have your hands free to place the record and manipulate the player. A small inconvenient is that the briefcase doesn’t provide a storage compartment for the power cable, which makes the player less portable. 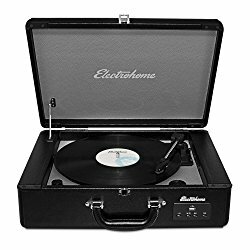 The Electrohome Archer Portable Turntable has very good ratings, in fact it’s probably the best rated among cheap portable turntables. It has better ratings than Crosley and Sylvania. Many consumers that have used a Crosley Cruiser in the past, have had a better experience with the Electrohome Archer EANOS300. To be honest if you are going to try 3 cheap turntables before finding a good one, why not buy a better turntable from the beginning? Overall, consumers are satisfied with the sound quality and construction of this product. They appreciate the beautiful vintage look and the automatic arm return feature. But the one feature that consumers brag most about, is the ability to close the top during playback. Most owners like the size, portability an lightness of this turntable. The number one complain about this product is skipping, specially with newly pressed albums. This is a known issue, not only with this model, but many record players have problems tracking well new vinyl records. The manufacturer advice is to tape a coin on top of the needle to fix the spiking. I always recommend my readers to do that as a last resource, you don’t want to damage your records or the stylus. Before tapping a penny, make sure your player is leveled and that your vinyl records are clean. Use a spirit level to make sure your turntable sits on a leveled surface. I can’t stress this enough. The fact that this is a “portable” turntable doesn’t mean that you can operate it on your bed, couch or your lap. I’m using the bed example because I have read review comments about it. The arm moves easily with gravity, your player will skip if it sits on an inclined surface, it’s a pendulum. A record player is not like an iPod that you can use it in any position, it needs to be completely flat and leveled on top of a heavy and sturdy surface regardless of its portability. Several consumers consider the inability to attach external speakers an important disadvantage, and so is the lack of a storage compartment for the power cord. Other issues reported include units that stop working in less than a year, the interior material peeling off and the automatic arm return not working after a while. The good news is that customers brag about Electrohome’s outstanding customer service. The player has a 1 year limited warranty. I think this is a better alternative than the Crosley Cruiser unless you need to attach external speakers. 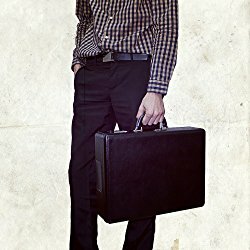 This product has good reviews and ratings. Overall, consumers are satisfied with this product for its sound quality, portability and look. The automatic return feature and the ability to close the top during playback differentiate this product from its competitors. However, the lack of output ports is an important disadvantage. My concern with this product is the many complains about skipping and the questionable durability. 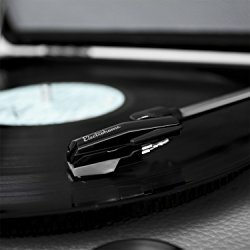 I recommend this product to someone wanting to occasionally play their old albums. 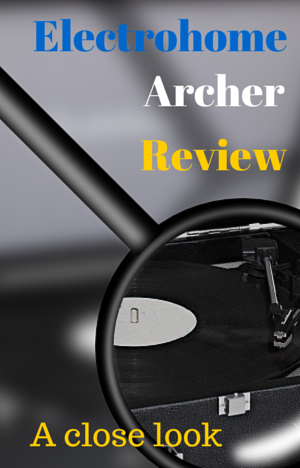 Don’t recommend it for serious vinyl collectors or if you are going to use it very often. If portability is not a requirement to you, I would definitely buy something better. As I mentioned before, for the same price you can get the excellent and fully automatic Audio Technica LP60. This Electrohome turntable works well, but the sound is terrible. It has a very high pitch sound with No Bass at all. I purchased replacement needles from Electrohome in Niagara Falls, but it made no difference. This was a gift so I have to keep it. 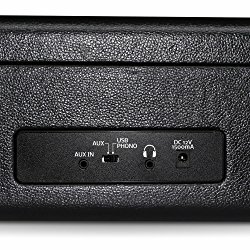 I dont think there is any reason for producing a product that sounds this bad, with no bass or treble controls….and no way to connect external speakers. Very disappointed in sound is all I can say. Thanks Ross for your input. Other readers will benefit from your opinion. Sorry about your experience with the Electrohome Archer. The worst part, as you said is that the Archer doesn’t have outputs. So you cannot connect the player to external speakers.